These boxes are constructed using the old-fashioned marquetry technique- cutting wood veneers by hand and then piecing them together- a labor of love. Each wood design is entirely unique, as each piece is made one at a time by hand. No lasers or saws are used in making the wood images. We also do not use stained or dyed veneers- every piece of wood in the designs is its natural color. We do not do custom marquetry. Curly walnut box with hand-cut marquetry top in various wood veneers. Spalted tamarind wood base. Hinged. This box is handmade and is one-of-a-kind. The top was made by cutting wood veneer by hand and pieces the pieces together- this took many painstaking hours. The box itself is made of lovely curly walnut with ripply figuring in the wood. The inside base is made of spalted tamarind wood, with lovely coloring. All the colors in these woods are entirely natural- no stains or dyes were used! 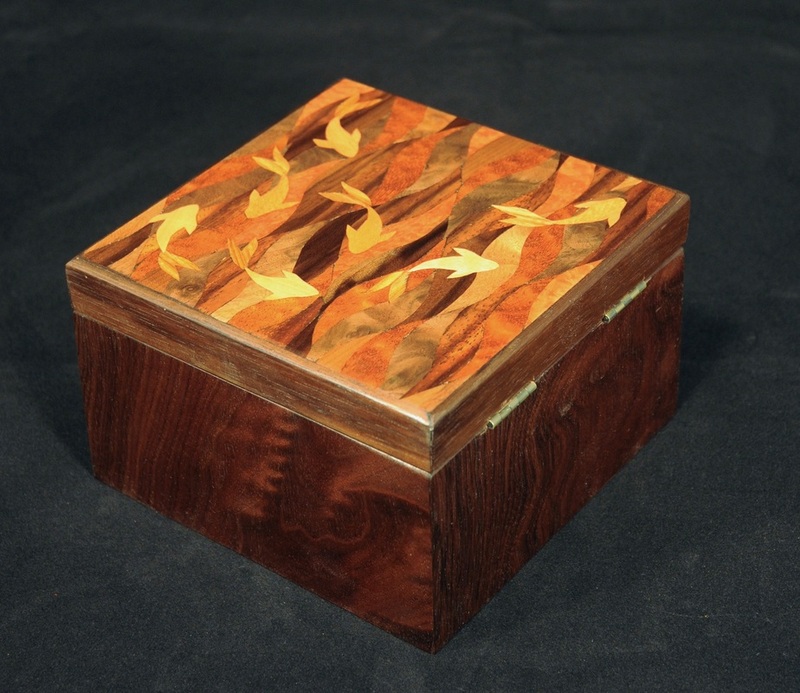 Mahogany box with top of hand-cut marquetry in various veneers. Hinged, lined with red suede. This box is handmade and is one-of-a-kind. The top was made by hand-cutting veneer wood and pieces the pieces together- this design took many painstaking hours. All the colors in the wood are entirely natural- no stains or dyes were used (yes- even that purple is natural!). 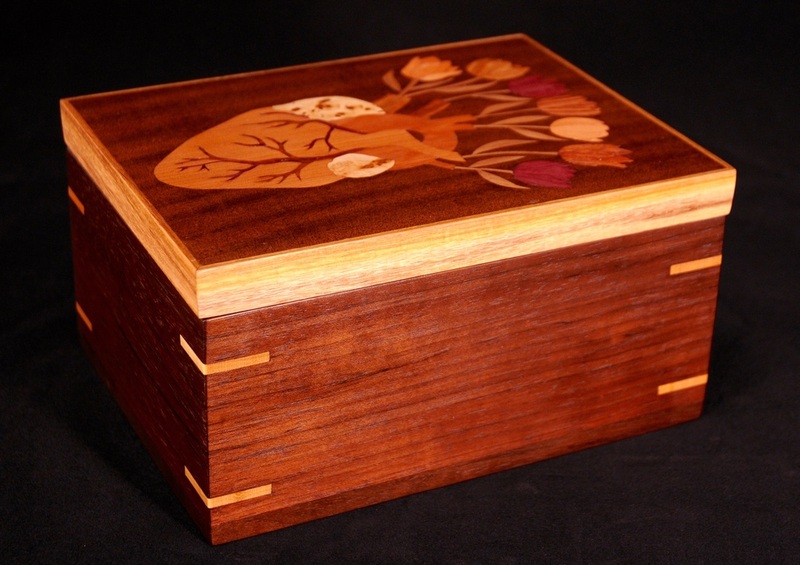 The box was made of mahogany with lovely canarywood key joinery and banding. It is hinged, and the inside is lined with top-quality soft red suede (suitable for inside a heart). This is a totally unique piece of art that doubles as a functional box. Perfect for keepsakes, jewelry, tarot cards... or just to look at. A perfect gift for someone who makes you feel like flowers are sprouting from your heart (in a good way). 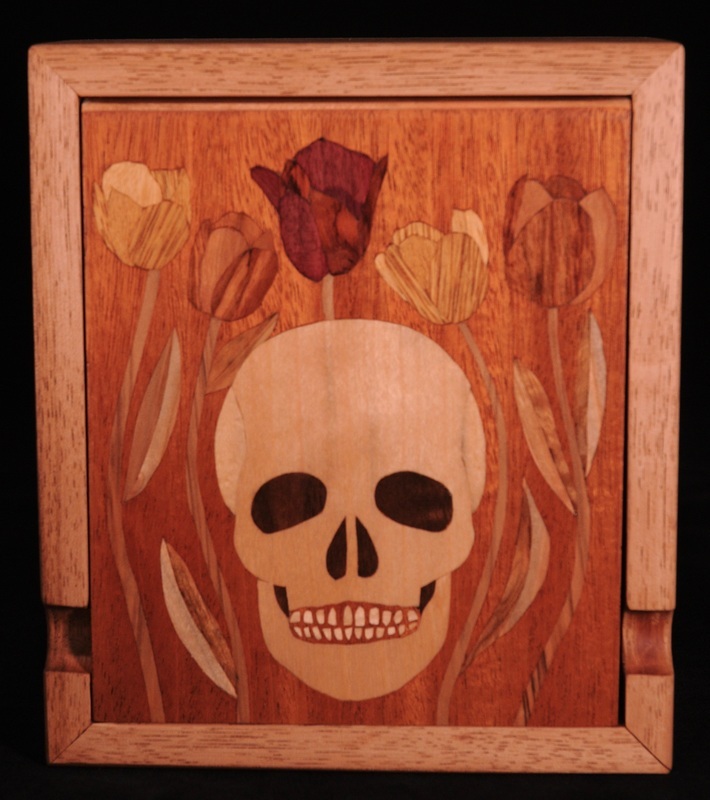 Cherry lid with hand-cut marquetry skull and tulips. Cherry sides, maple base, wenge key joinery, interior hidden hinge. This box is handmade and is one-of-a-kind. 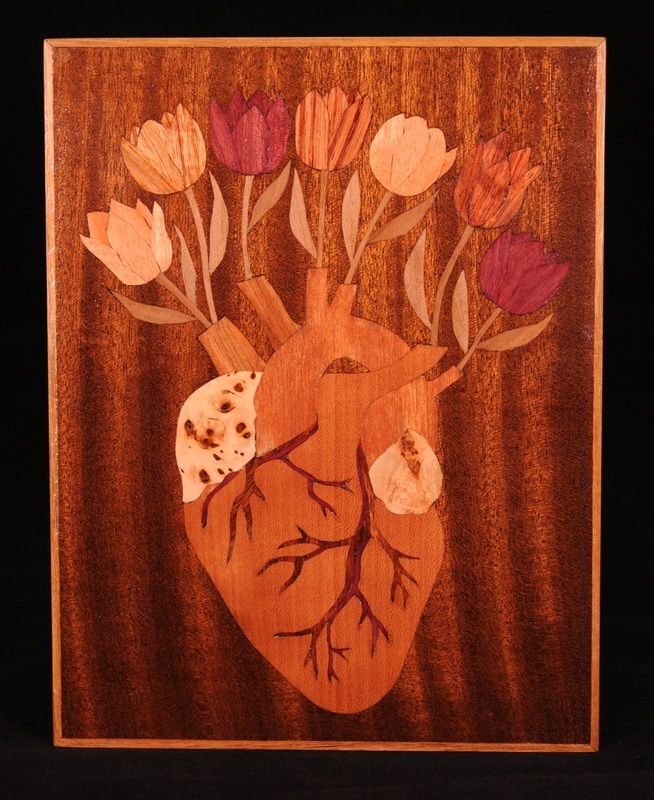 The top is marquetry- a technique made by hand-cutting pieces of wood veneer and piecing them together- this design took many painstaking hours to make. All the colors of the skull and flowers are entirely natural- no stains or dyes were used on them. The design is fixed to a cherrywood top. The box is also made of cherry, with a figured maple base, and striking dark wenge wood key joinery at the corners. The lid is hinged with a hidden interior hinge, and is set into the box. There are two small curves cut into the lid so you can lift the lid. This is a breathtaking and highly detailed piece of art that doubles as a functional box- a perfect place to store your treasures. Entirely handmade by is in our Austin, TX wood and glass studio.